Pura vida! That’s Costa Rica’s tag line and it truly does give you a taste of a pure life. With its myriad outdoor sights and adventures, we thought that we’d have to spend another post on the delights that it holds. At this very moment, we’re in Hawaii which is giving us many wonderful memories to share with you on our return. In the meantime, we have a new YouTube channel [but don’t tell anyone! We’ll launch on our return!]. On that channel we’ve begun to create videos for a more on-the-scene kind of information for those who are sharing these experiences with us. So, until we return home full of stories about the Hawaiian Islands for you, welcome to La Mansion Inn in Manuel Antonio, Costa Rica! Arenal Volcano puts on a light show every night it's not shrouded in cloud & mist. Just mention to someone that you’re headed to Costa Rica or that you’ve just been to CR and inevitably they either gush about their own trip or lament that they have yet to check it off their list. Either way, it seems that Costa Rica lives up to its tourism promotion. That isn’t to say that there are not – how can we put this delicately?—some “issues” like bridges that would be condemned on this part of the North American continent and let’s not forget those crocodiles lounging below. But those are small points. The trick for the discerning traveler is to find a balance between truly getting the experience and having a luxurious experience. We think we found the balance. Our first stop in planning the trip was to our trusty travel agent – did we say how much we adore Angela? Well, we do. 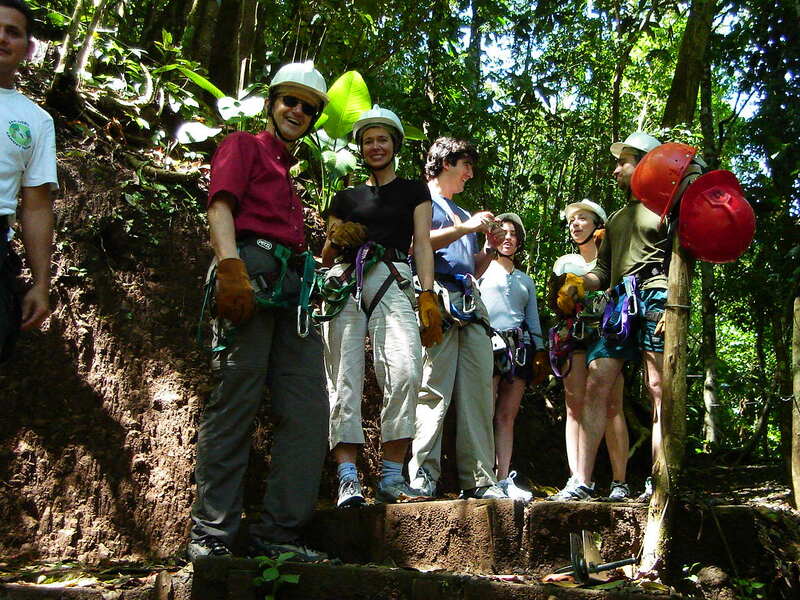 Angela recommended one of her colleagues who is a Costa Rica expert to help us create the perfect, personalized tour. Maxine, the expert, suggested that we book a private guide to take us to a variety of places in the country – one who would pick us off and drop us off, sometimes for a several day stay, but every time he would return for the next leg. And so we planned 12 days starting and ending in San Jose, the capital of Costa Rica. We flew in to the very modern airport in San Jose and were whisked by our guide and driver Senõr Mezza to the Marriott Hotel Costa Rica. A Latino-themed oasis not far from the airport in the middle of a massive coffee plantation area, the hotel provided us with a great place to begin to get acclimatized. 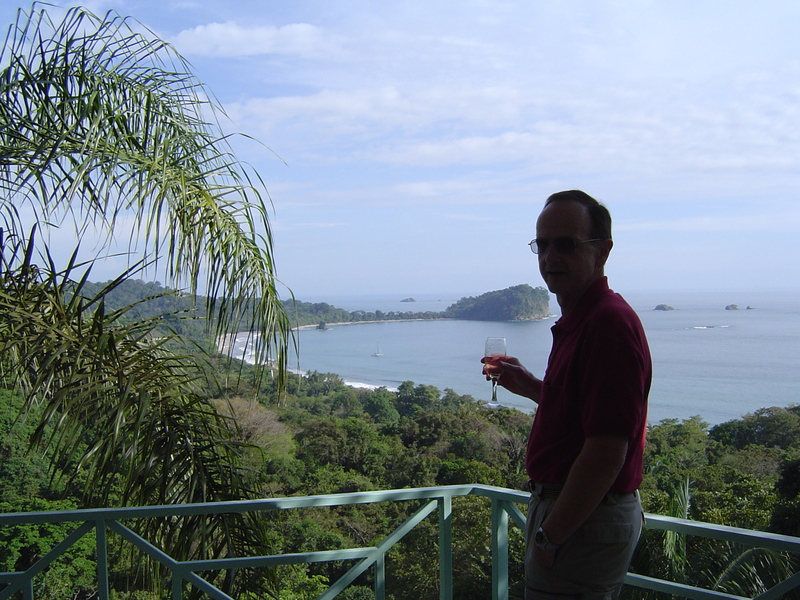 The next day was off to the Pacific coast – to Manuel Antonio. Although it looks like it would be a short drive (it would be in this part of the world), the driving conditions mean that it will take hours to get there. Not to worry, the countryside is picturesque and our guide seemed to know everyone along the way, taking us to lunch at places that tourists never see. Wonderful! He even warned us when to close our eyes. That would be when crossing a river on a bridge whose road-bed one could see through to the crocodiles below. The planks would hold, he told us! Manuel Antonio is like no other place we’ve been. The national park is breathtaking with its rainforest and its seemingly endless miles of unspoiled beaches. 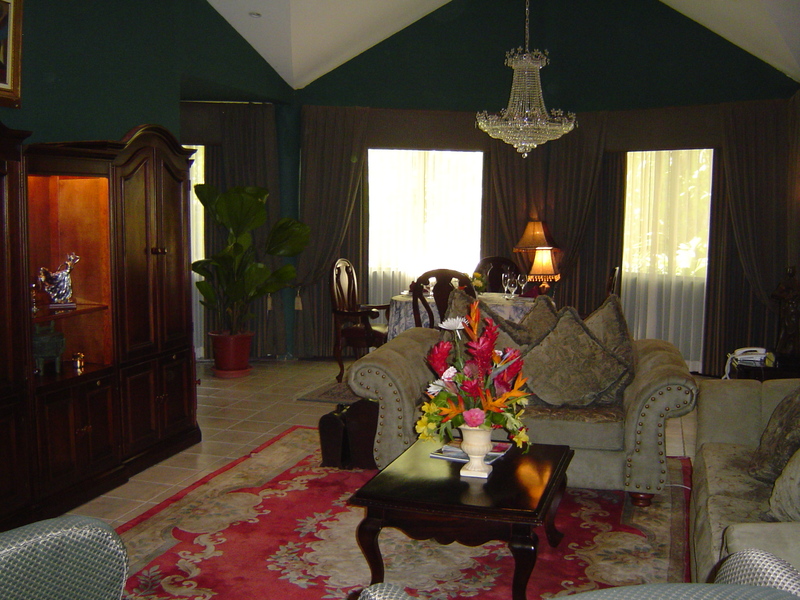 We checked into our mini-suite at La Mansion Inn to find that we had been upgraded to the largest suite in the place. It was four days of bliss – even when the power went out as we readied ourselves for dinner one night. We found ourselves the only guests in the small dining room now completely candle-lit, and with one wall open to the garden, with the chef working feverishly with electricity from his generator. It was extraordinary. We hired a guide to take us hiking into Manuel Antonio national park where we spied sloths, monkeys, miles of beaches and, surprisingly, very few other people. It was fantastic! The view toward Manuel Antonio National Park from the balcony of our suite at La Mansion Inn. When we left the Manuel Antonio area on the Pacific Cost, we headed inland and north to Arenal volcano where we checked into the Tabacon Spa and Resort for three days. We experienced the thermal springs and hiked in the rainforest – again with a guide who was also our guide for a small group tour by boat to the northern border where Costa Rica meets Nicaragua. Our next stop was Los Suenos on the Pacific coast for one night at the Marriott resort there. A beautiful hotel on a wide, muddy beach, the Marriott here is less a Costa Rican adventure than an American refuge. It is very nice, but we could have been in any warm spot in the US. Comfortable but perhaps not quite the Costa Rican experience we were seeking. One night there was enough and then we were off again. Before we headed back to San Jose, Senõr Mezza, our guide, insisted that we couldn’t leave until we had zip-lined across the canopy of the rain forest so he deposited us at one his favorite establishments. It was something that we had wanted to do, but were just a bit hesitant. Given his insistence that we would enjoy the experience, we could hardly decline. After being fitted out with the ‘gear’ including harness, gloves and helmet, we joined a small group of young Americans and began our tour, zipping from one platform to another. But there was no going back. She had to zip-line from this platform ever onward – which she did. At the end, she was very relieved, but had faced her fear. Our fear had been less of heights (although Art does have that tendency and I’m just sensible enough to avoid them most of the time), and more of the “are we too old for this?” variety. Being over 50 (and one of us over 60), it seemed relevant. However, it is an experience that you must have, regardless of your age. If you’re fit enough to travel to Costa Rica at all, then you’re fit enough to try zip-lining. The views cannot be matched through any other experience. And there’s just something about having done it. Back in San Jose, we toured the city – and if there is one point not to be missed it has to be the opera house, Teatro Nacional. Yes, the opera house. It is reminiscent of the opulence of the Opera Garnier in Monte Carlo, which was designed by the same architect as the Paris Opera (Garnier), so you can imagine its magnificence. Just sitting there in the orchestra, we could imagine the opera fans of a bye-gone era resplendent in their finery, horse-drawn carriages outside awaiting the final curtain. 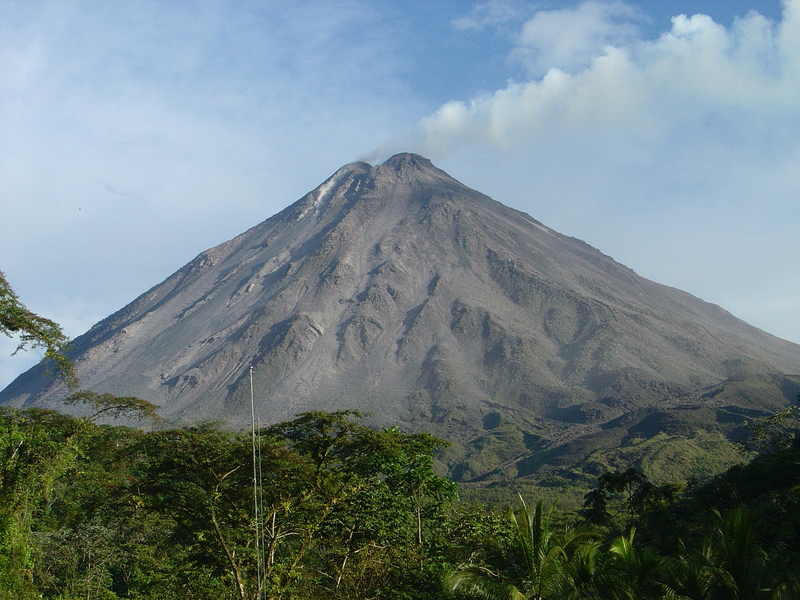 Yes, Costa Rica is rich in history – but even more, it is rich in natural grandeur. They do live up to their tourist slogan: Pura vida!